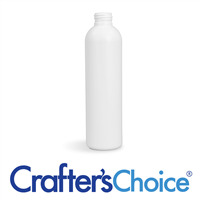 The 32 oz white HDPE bullet bottle is white in color and opaque. The bottle is constructed of HDPE plastic (recycle number 2). Complete the packaging with a 28/410 top (sold separately). COMMENTS: Perfect for transferring oils from gallon bottles. 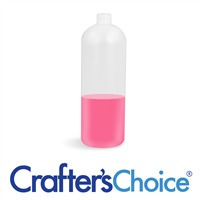 COMMENTS: This is a good size bottle for large batches of liquid soap and hair care. I needed something larger than what I had. This is perfect and a great price. "32 oz White HDPE Bullet Bottle"
COMMENTS: This and the 16-oz bottles -- I use them to store and dispense many things; very versatile and sturdy bottles. It's hard to find larger than 16 oz bottles and jars, so thank you WSP! "Is this safe to package plant based milk product for human consumption? We would like to put almond or cashew milk in it?" Staff Answer You would need to do testing for that application. We do not test for food applications. "Are these safe to put in the microwave?" Staff Answer We would not recommend placing these bottles in the microwave.